This simple yet satisfying coconut cookie recipe has been around for generations. Pressing a fork into the top gives the look of an old-fashioned washboard. 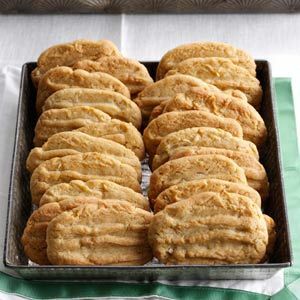 In a large bowl, cream butter, shortening and sugar until light and fluffy. Beat in eggs. Gradually add water and vanilla; mix well. Combine the flour, baking powder, baking soda and salt; add to the creamed mixture and mix well. Fold in coconut. Cover and refrigerate for 2-4 hours. sheets; flatten with fingers into 2-1/2-in. x 1-in. rectangles. Press lengthwise with a floured fork. Bake at 400° for 8-10 minutes or until lightly browned. Cool 2 minutes before removing to a wire rack to cool completely. Yield: 9 dozen.